Supernova remnant SN 1987A captured by the NASA/ESA Hubble Space Telescope in January 2017. The strikingly bright shock waves from a massive star explosion first observed in 1987 can still be seen today, three decades later. This brilliant star explosion, called Supernova 1987A, occurred only 160,000 light-years from Earth in a satellite galaxy of the Milky Way known as the Large Magellanic Cloud. When it was first discovered on Feb. 23, 1987, the supernova was one of the brightest observed and closest to Earth, providing astronomers with a unique opportunity to study the phases before, during and after the death of a star, officials said in a statement from the European Space Agency (ESA). 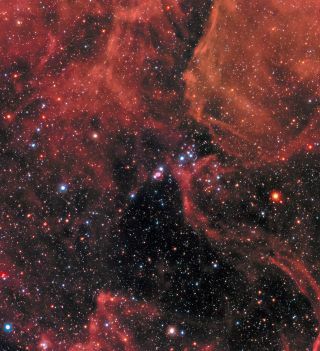 "Because of its early detection and relative proximity to Earth, SN 1987A has become the best studied supernova ever," ESA officials said in the statement. "Prior to SN 1987A, our knowledge of supernovae was simplistic and idealized. But by studying the evolution of SN 1987A from supernova to supernova remnant in superb detail, using telescopes in space and on the ground, astronomers have gained revolutionary insights into the deaths of massive stars." This view of SN 1987A's supernova remnant combines observations from the Atacama Large Millimeter/submillimeter Array (ALMA) in Chile (red dust at center), the Hubble Space Telescope (green glow of visible light) and the Chandra X-ray Observatory (the hottest gas, in blue). The green and blue show the explosion's expanding shock wave colliding with surrounding material. The Hubble Space Telescope has also studied the supernova in great detail since it launched into space in 1990. At the time, "Hubble was the first to see the event in high resolution" and clearly image the structure of the supernova, which consists of a main ring surrounding the exploded star and two fainter outer rings, ESA officials said. The Chandra X-ray telescope, which launched in 1999, has also been keeping a close eye on the expanding cloud of gas and remnant star material over the years. Based on the latest observations of SN 1987A, astronomers have found that the gas and star material was ejected 20,000 years before the supernova explosion actually occurred. Slow-moving stellar winds initially carried some of this material away from the dying star. However, as the doomed star neared the end of its life, it evolved into a hot body and generated faster stellar winds that caused the slower material to pile up and form the concentric ring-like structures observed around the exploded star, ESA officials said. "The initial burst of light from the supernova illuminated the rings. They slowly faded over the first decade after the explosion, until the shock wave of the supernova slammed into the inner ring in 2001, heating the gas to searing temperatures and generating strong X-ray emission," ESA officials said in the statement. "Hubble's observations of this process shed light on how supernovae can affect the dynamics and chemistry of their surrounding environment, and thus shape galactic evolution."